The Keencut Straight Edge, in silver anodized aluminum, is a superb straight edge for use in marking, drawing, pen-lining, scoring or cutting. In fact it can be used with all types of hand-held tools where accuracy is required. The Keencut Straight Edge is strong, precise and portable and comes fitted with two full-length grip strips to steady the straight edge and protect sensitive surfaces. Safe to use, the straight edge has an integral finger guard and a full-length stainless steel bead to resist wear to the edge and the tools. 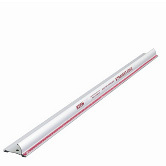 The Keencut Straight Edge is available in eight convenient sizes from 60cm (24") to 180cm (72").